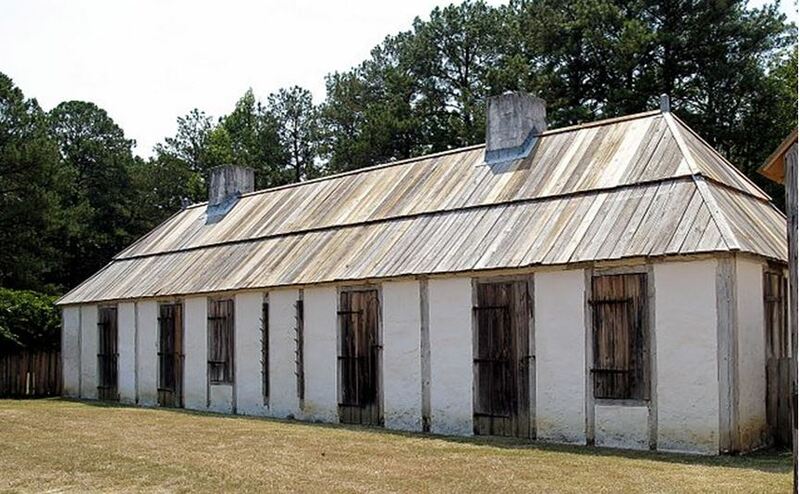 Fort Toulouse is a historic ​fort of the French Colonial era that is located near the city of Montogermy, Alabama that was constructed by Francois Saucier. It is now maintained by the Alabama Historical Commission. The French first founded the fort in 1717, naming it for Louis-Alexandre de Bourbon, comte de Toulouse. In order to counter the growing influence of the British colonies of ​Georgia and Carolina, the government of French Louisiana erected a fort on the eastern border of the Louisiana Colony in what is now the state of Alabama. The number of troops in garrison varied between 20 to 50 French Colonial Marines. Living and working at the fort, the Marines traded extensively with the local Creek Native Americans and cultivated friendly relations with them. The French would trade European goods such as Flintlock guns, ammunition, and gunpowder, iron tools, knives, glass beads, copper pots, and wool blankets in exchange for local food stuffs, fur and deer skins. Due to the poor living conditions at the fort, which was neglected by the French government, the troops had mutinied in 1722, but were soon reconciled with the Fort Commander and changes made. By the early 1740's, conditions had vastly improved at the fort. In 1743, Francois before his marriage, had been assigned to Fort Toulouse as its engineer and had moved there from Mobile to oversee its maintenance and construction projects. The humid climate caused deterioration of the fort by the late 1740's. The French Colonial government planned for a third fort to be built. Under the direction of the Colonial Engineer Francois Saucier and a crew of soldiers. The construction of the new Fort Toulouse was completed in early 1751. By the time Francois completed its construction the final cost of the new fort was nearly half of the military budget for the whole Louisiana colony. Francois and his wife spent much time during the first of years of their marriage traveling between Fort Toulouse and Fort Louis in Mobile. During this period Francois oversaw the construction of Fort Toulouse and the maintenance of both forts. Eventually Francois and his family returned to Fort Louis in Mobile and in mid 1751 he was called to New Orleans where he was given the assignment to construct the new Fort de Chartres in Illinois. This was to be his last assignment. In 1763 the Treaty of Paris ended the French and Indian War. As the French had been defeated by the British and had ceded their territory, the French garrison spiked their cannons and left for New Orleans and eventual some returned to France. The British chose not to occupy the Fort, which eventually collapsed into decay. The site was declared a National Historic Landmark by the Department of Interior in 1960. During the American Bicentennial, local groups supported the reconstruction of Fort Toulouse. But, the replica was incorrectly built using the outline of the much larger Fort Jackson rather than the historic French fort originally constructed by Francois Saucier. In the 1980's the park was acquired by the Alabama Historical Commission. It dismantled the incorrect replica and constructed a correct replica of Fort Toulouse as was originally reconstructed by Francois and his crew near its original site. The picture below is part of the reconstructed Fort Toulose north of Montgomery, Alabama that was constructed by Francois Saucier and is now part of the historic National Fort Toulose Park. 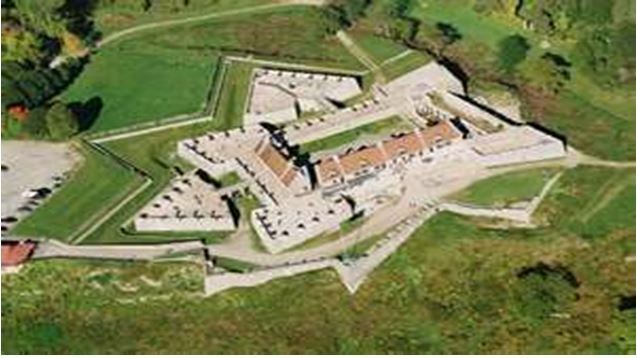 The photo below shows the complete layout of Fort Tombecbe that was constructed in 1736-37 by Francois Saucier. Fort Tombecbe was a stockade fort located on the Tombigbee River near the border of French Louisiana, in what is now Sumter County, Alabama. It was constructed by Francois Saucier in 1736-1737 under the leadership of Jean-Baptiste Le Moyne, Sieur de Bienville as a trading post located about 270 miles upriver from the Mobile colony, the fort was located on an 80-foot limestone bluff. Fort Tombecbe, built in Choctaw lands would play a major role in colonial France's efforts to stop the British intrusions into the area. Bienville claimed that the new fort was to protect the Choctaw from the Chickasaw. Fort Tombecbe was a major French colonial outpost and trade depot among the Choctaw, the largest Native American group in the colony. Control of the fort passed to the British in 1763, who renamed it Fort York. In 1793 Spain acquired the site, by then the fort had been abandoned, from the Choctaw via the Treaty of Boukfouka and built a new fort, which was named Fort Confederation. After the United States took possession, via the 1802 Treaty of Fort Confederation, it continued to be used as a trading post with the Choctaws until its eventual abandonment in the 19th century. The Fort Tombecbe site is currently owned by the University of West Alabama and the Archaeological Conservancy, and is operated by the staff of the University's Black Belt Museum.